Last year I gave a talk in SESUG 2013 on list manipulation on SAS using a collection of function-like macros. Today I just explored in my recently upgraded SAS 9.4 that I can play with list natively, which means I can create a list, slice a list and do other list operations in Data Steps! This is not documented yet(which means it will not be supported by the software vendor) and I can see warning message in Log window like “WARNING: List object is preproduction in this release”, and it is still limited somehow, so use it in your own risk (and of course, fun). Adding such versatile list object will definitely make SAS programmers more powerful. I will keep watch its further development. II. 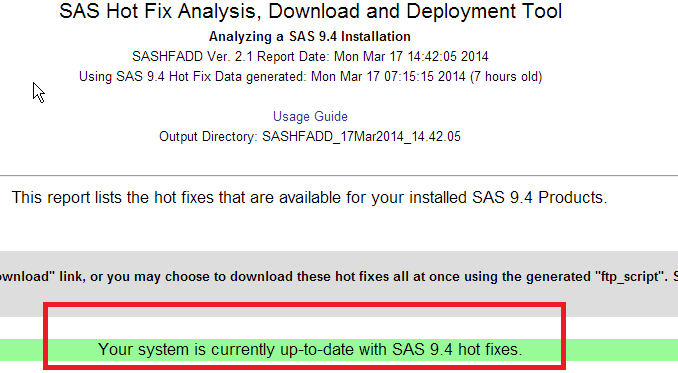 Make sure all hotfixes were applied (You can use this SAS Hot Fix Analysis, Download and Deployment Tool). 3. List is Immutable in SAS!? hhh, I need to create a new list to hold such modification? This is funny. Based on my quick exploration, the list object in SAS is pretty intuitive from a programmers’ point of view. But since it’s undocumented and I don’t know how long it will stay in “preproduction” phase, just be careful to implement it in your production work. 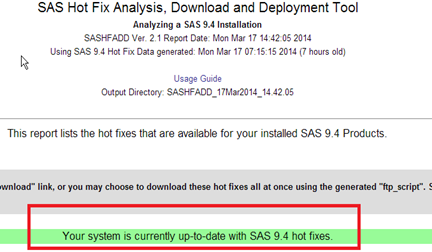 Personally I feel very exciting to “hack” such wonderful list features in SAS 9.4. If well implemented, it will easily beat R and Python (which claim themselves supporting rich data types and objects) as a scripting language for SAS programmers. I will keep update in this page.